A termite infestation can be a homeowner’s worst nightmare. Your home is 10 times more likely to be damaged by termites than by a fire. According to Pest World, termites can cause over 5 billion dollars in annual property damage. It is estimated that 1 in 30 homes is damaged by termites. AmeriGuard Pest Defense is here to help solve your termite problem and provide you with peace of mind for your biggest investment – your home. AmeriGuard Pest Defense is a full service termite company, specializing in structural fumigations, secondary local “spot” treatments and wood repair services. We provide free “limited” termite inspections to homeowners. We also provide complete inspections for $89. A complete inspection is always recommended. AmeriGuard provides termite control solutions to the following cities: Banning, Beaumont, Canyon Lake, Cherry Valley, French Valley, Hemet, Homeland, Lake Elsinore, Menifee, Murrieta, Nuevo, Perris, Quail Valley, Romoland, San Jacinto, Sun City, Temecula, Wildomar and Winchester. 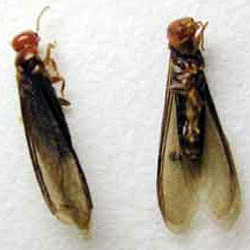 There are two species of termites that infest structures in Southern California. These species are the drywood and subterranean termites. Drywood Termites make their nests in the wood itself as well as use the wood as a food source. Colonies range up to several thousand, which can cause substantial damage. Drywood termites prefer to hide in areas that are inaccessible, such as: rafters, eaves and deep inside walls and flooring. Subterranean Termites nest underground in “crown colonies” that invade structures at a distance, setting up satellite termite colonies in your structure. They can be found in sub areas, attics and baseboards. The also infest bathrooms, where moisture is readily available. How Does AmeriGuard Treat For Termites? For drywood termites that extend into inaccessible areas, our primary recommendation is a full structure tent fumigation, which requires sealing off the structure and using commercial fumigants like Vikane or Zythor to provide total termite knockdown. In situations where the infested wood members are accessible, we offer local treatments which do not require fumigation. Applying termiticides to soil around the external foundation creates a chemical barrier against the termites and is accomplished by trenching, rodding or drilling. In situations where Subterranean termites are making their way into the structure from soil tubes, we trench and treat or rod and treat the affected areas with residual termiticides to stop termites in their tracks. A treatment for slab construction consists of drilling through the slab floor and injecting termiticides into the soil along the inside perimeters of the foundation. Crawl spaces treatment also involves trenching or rodding soil along the foundation walls and around pipes and piers. We then apply termiticides to the soil. AmeriGuard Pest Defense provides lasting termite control by using Termidor, which spreads through the colony like a virus, effectively killing off the termite colony. AmeriGuard Pest Defense is a Termidor Certified Professional company. Only a Termidor certified company can treat your home with Termidor. The social aspect of the nature of termites makes them a prime target for Termidor. Termidor controls termite through direct and indirect contact. Termites are unable to detect Termidor and consume and contact it as they go about their day-to-day routine. The infected termite becomes a carrier of Termidor and thus the “Transfer Effect” begins with termites unknowingly spreading the active ingredient between the colony. All of AmeriGuard Pest Defense’s termite treatments are guaranteed to protect your structure. Our local termite treatments are guaranteed for 1 year, and structural fumigation receives a 2 year guarantee against future infestations.